This Lovehoney Flaunt Me Floral Lace Balcony Cup Basque is one of my favorite pieces of lingerie for many reasons. 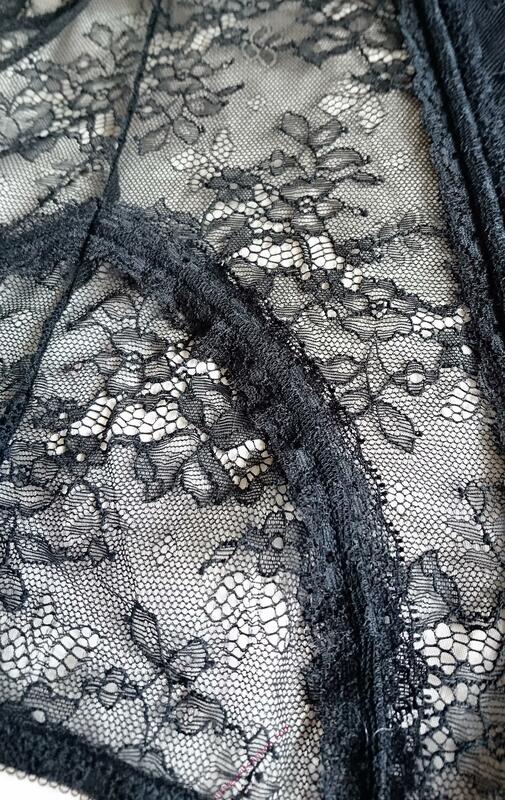 The lace used to make this basque is super soft and allows the skin to be visible the whole way round bar the cups and one panel at the front. I love how feminine the lace look against bare skin and I instantly fell in love with this piece because of it. Regards packaging, it comes in a clear cellophane bag. Nothing really spectacular to comment on and if purchasing this piece, I would highly recommend picking up a gift box/bag to pop the set into as I do feel the packaging lets down how luxurious the set is. The set comes with a matching G-string, which complements the basque perfectly. It is also attached to the basque with those plastic ties which you generally find keeping your socks together. I do recommend using scissors to remove these in case you damage any of the material, as it’s quite delicate. The cups of the basque are padded and surprisingly offer quite a lot of support. I fluctuate between a B and C cups and the cups can easily accommodate both sizes but wouldn’t take any more in size medium. You would need to size up I think. The basque has a hook and eye tying system at the back and would accommodate sizes 32-36 easily! I again fluctuate between 32 and 34 but I do however find the middle the most comfortable to wear. Like all Lovehoney lingerie, their signature, silver Lovehoney heart logo charm placed on top of a satin bow, is present between the underwired cups. I love this little touch. One because it’s shiny and two, I find such a simple little feature adds such an expensive feel to the item. The basque is boned with plastic, which creates a sleek silhouette. The plastic bend and adjust position with body movement, which I like if I’m honest as I find it can be more comfortable to wear. This Lovehoney Flaunt Me Floral Lace Basque also has 4 completely adjustable and removable, stocking straps. This allows you the chance to create a varied look and also allows the piece to be customized. The straps have strong grips and keep the stockings in place. Regards washing, it’s hand wash only in cold water. This will help maintain it’s colour and shape and the washing machine can sometimes be a bit harsh on delicate items. I usually let mine drip dry on a hanger and I never have issues with fittings after washing. This item was sent to me in exchange for an honest and impartial review – this however in no way changes my opinion on the item. What I honestly think, you read! All images displayed are of myself modelling Lovehoney Flaunt Me Floral Lace Balcony Cup Basque.